Les Bossus. Louis-Léopold Boilly, [Recueil de grimaces], G. lith. de Delpech, 1827. “Les Bossus” or “The Humpbacks” by Boilly is also from “Recueil de grimaces.” Depicted in art for millennia as evidenced by numerous ancient Greek statues, hunchbacks have been treated as outsiders and stigmatized as vile and base. 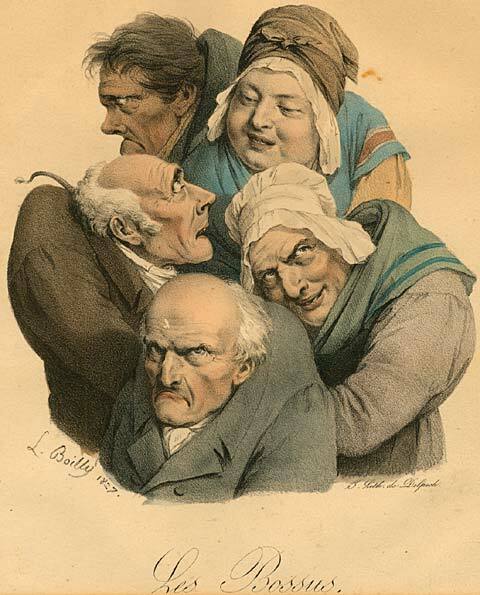 Artists, fascinated by the grotesque, used hunchbacks to symbolize lower and lower-middle classes during the French Restoration (1814-1830) and beyond.16 In addition to the lithograph by Boilly, two other French prints in this exhibit feature hunchbacks: Pigal’s benefactor in “Mœurs parisiennes” and both figures in the caricature illustrating the proverb that one half of the world makes fun of the other. While the benefactor and one of the women in Boilly’s work look pleasant, the remaining four figures in Boilly’s print and the proverb figures have decidedly mean or sly countenances.